The death of a beloved polar bear casts the logic of zoos in a cold light. Are they safe havens or places of sacrifice? 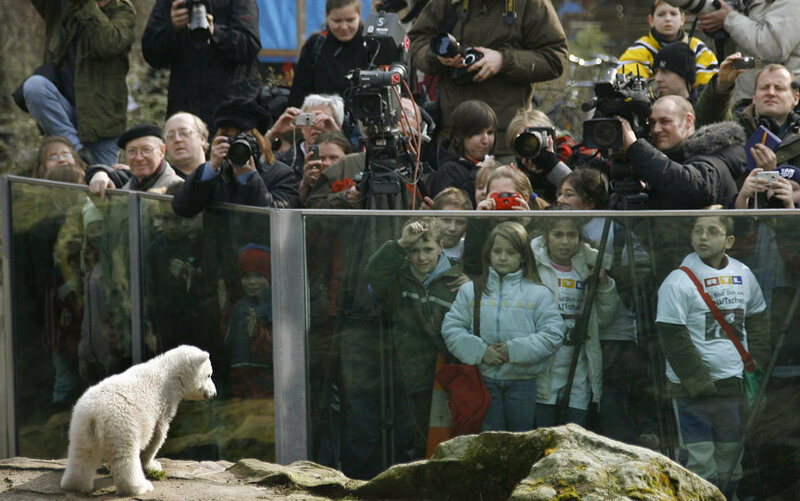 The visitors to Berlin zoo crowded round the enclosure looking, pointing, waving, photographing, and calling out to the most popular inhabitant: Knut the polar bear. He was lying next to his pool, alone in the outdoor space he usually shared with three female bears. He appeared relaxed, perhaps enjoying the thin, mid-March sunshine. Then he hopped up, as if bitten, his left hind-leg twitching. He started turning in a tight circle, like he was trying to get whatever it was that had his limb in its grip. Some of those watching laughed. ‘It seemed like he was dancing,’ one of them said later. But the laughter broke off as the spasms in his leg grew in violence. The bear’s rotations became frenzied, then stopped. The convulsions spread up his body, taking control of his back, his neck, his head. He looked like he was being pulled by invisible ropes, first sideways over the rocks, and then down into the water with a muted splash. That was when the screaming started. Some of the onlookers shouted for help, others called out ‘Knut, Knut!’ as if to warn him of the danger. One woman quietly repeated, ‘Oh my God, oh my God.’ With jerking movements, Knut tried to raise his snout out of the water and breathe, but failed. He was drowning. Children who had been asking their parents ‘What’s he doing, mummy?’ began to cry. The shouts of the visitors grew more urgent, as though they believed some superhuman zookeeper could dive in to rescue the 300 kg bear. A few seconds later, only Knut’s torso was left above the waterline; his head had sunk, though he still twitched with the last remnants of life. Then bubbles erupted to the surface as the air in his lungs was expelled — and he was still, floating face-down in the pool. A hump of white back protruded from the water like an iceberg, while his legs and head were suspended in the dank, greenish pool. By the time zoo staff arrived to cordon off the enclosure and lead away the horrified crowd, it was clear that Knut was dead. Within hours of Knut’s drowning on 19 March 2011, accusations were flying. And they were all aimed in one direction: at the Berlin Zoological Garden. From the moment he was born there on 5 December 2006, the polar bear had been the centre of attention and controversy. Now, in an unlikely alliance, those who opposed keeping animals in captivity were united with regular zoo-goers in condemning the way Knut had been kept. Many claimed to have seen his death coming. Knut was just over four years old when he died, and not yet fully grown. Male polar bears do not reach their full size until they are at least eight years old, by which time they can weigh around 650 kg and be 2.5 metres tall. In the wild, most live for around 15 to 18 years, and some up to 32. So Knut, although already three or four times the weight of the average man, was still only a boy by polar bear standards when the fatal seizures came. His death was premature. Of course, bears can die at all ages. Young males in the wild have a hard time — usually pushed into independence by their mothers at the age of two, they must struggle to survive in the harsh conditions of the arctic. But Knut did not have to struggle to survive. His fish were tossed to him daily, along with meat, fruit, bread, and — his favourite — croissants. He did not have to wrestle with walruses, fight off rivals, or cope with temperatures of -60 °C. His needs were catered for by experienced keepers, and his health checked regularly by the zoo’s vets. His sudden demise was a mystery. Amid the surprise and shock, the critics were convinced: the unnatural conditions of the polar bear’s life made an unnatural death inevitable. This is the paradox of the modern zoo: although they promise nature, they are necessarily unnatural. We visit them in search of the unpredictable, the vital — the sublime that cannot be found in the clockwork world we have built for ourselves. Yet they are made by humans, with all the artifice, technology and tools at our disposal. The lion and the zebra in the zoo will never meet in mortal struggle as they do daily on the Serengeti, but instead each is carefully contained, their needs met by plans, plumbing, and delivery vans. Zoos have redefined their mission since the days of the menagerie, when people were content to show animals as spectacles and subjugates. Today, keeping wild animals behind bars demands justification beyond amazing or amusing us, and this is made on three grounds: research, education, and conservation. Each of these depends upon an idea of nature out there, beyond the city limits — a nature to be researched and understood; a nature about which we can and should be educated; and a nature that zoos want to help us conserve. But Knut’s life was unnatural before it had even begun. His father, Lars, was born in a zoo in Munich and his mother, Tosca, was an East German circus bear, captured in Canada as a cub. Neither had known the struggles and satisfactions of living to adulthood in the Arctic wilderness. Knut was one of two cubs born to Tosca in Berlin zoo in December 2006. She rejected both of them, leaving them outside on a rock while she retreated into her den. The zoo was faced with either letting nature take its course — which would mean the death of both bears — or intervening and raising them by hand. With only a short time to decide, the zookeepers rescued the cubs — blind, pink, and the size of guinea pigs — using fishing nets. Knut’s twin brother survived only four days before succumbing to an infection. He died unnamed. Knut, however, flourished. The first 44 days of his life he spent in an incubator, fed every two hours with formula milk enriched with cod liver oil. He was then moved to a specially built box with room to roll about and play — which he did with the zookeeper Thomas Dörflein, who had rescued the cubs and become Knut’s surrogate mother. The bearded, pony-tailed, Elvis-singing Dörflein never left the little cub’s side, even sleeping next to him at night. At two months old, Knut was starting to look like a proper little bear. When not sleeping or suckling, he would toothlessly chew at Dörflein’s fingers or wrestle with his blankets. At three months old, he was allowed to splash in a bath tub and roll in the sand, but never strayed far from Dörflein. Berlin zoo regularly released pictures of his puppyish antics, to the delight of local newspapers. But Knut was still deemed too young to face the public in person. This was a gift to the world’s media. A cute bundle of bear is a one-off photo-op; a cute bundle of bear threatened with impending doom is a story. Even the foreign broadsheets couldn’t resist. In London, The Times ran with ‘Abandoned Cub Who Faces Death Sentence’; the Daily Telegraph with ‘Fate of Baby Polar Bear Uncertain’. Neither was correct: not only had Albrecht the activist been misquoted, but Berlin zoo would not have listened to him anyway. There were no ‘experts’ trying to get at Knut with a lethal jab, but the provocative idea was already out there: the next day children protested outside the zoo, calling for the cub to be spared. So the stage was perfectly prepared for Knut’s public debut a few days later, on 23 March 2007. The assembled cameramen, film crews and journalists in one of Europe’s largest capital cities, along with an already substantial fan club, were waiting. When he emerged with Dörflein, the little cub exceeded all expectations: innocent and playful, with his black button-eyes and nose, tuggable little ears and fluffy white fur, he was the fulfillment of all our Disney dreams. He was an animal star. The following day, Christina Meier was there with her camera. She had read about Knut in the paper and, as she lives close to the zoo, decided to see him for herself. ‘It was love at first sight,’ she told me as we sat at a wooden table on the terrace of Berlin zoo’s restaurant, overlooking the duck pond. She’d previously gone to the zoo just once a year, but started stopping off regularly on her way back from work. Soon she was visiting Knut daily. Meier started contributing to a blog about Knut run by the local television company. But it was loosely moderated, with discussions frequently degenerating into diatribes. So she started her own ‘Christina’s Cute-Crazy-Knut Blog’, publishing pictures and reports of Knut’s doings in English and German. She saw it as a kind of duty, bringing news of the little bear to those too far away to visit in person. Her site has had nearly two million hits, from more than 770,000 visitors in 50-plus countries. The living teddy bear appeared in newspapers, magazines and television shows around the world, even making it to the April 2007 cover of Vanity Fair alongside Leonardo DiCaprio, in a photomontage by Annie Leibovitz. Yet the daily images of Knut canoodling with Dörflein, his gruff human guardian, remained the most popular. Their play — tug of war with old boots, or splashing together in the pool — awoke the ancient fantasy of wildness tamed, of a nature reconciled to humanity. Like the Garden of Eden, it was transgressive, for portraying a world in which innate species barriers were broken, as well as utopian, for portraying a world in which beasts were not beastly, but sympathetic and biddable. Also like the Garden of Eden, it was not to last. Knut was growing rapidly: by October 2007, he weighed 100 kg, and was big and boisterous enough to injure someone seriously. 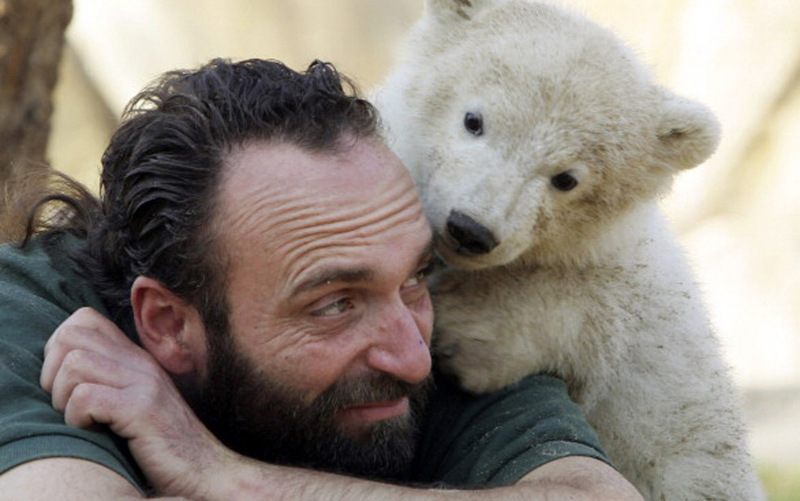 Campaigners such as Albrecht, who had been quoted as calling for Knut’s death, continued to criticise the zoo for raising a polar bear as if it were a pet: this sent entirely the wrong message about this fierce and formidable carnivore, he argued, and it was bad for the bear, preventing any possibility of a normal life, even by zoo standards. The zoo’s director eventually agreed: the daily Knut and Dörflein shows were stopped. When, shortly afterwards, the director saw photographs in a local paper of Dörflein continuing to romp with his charge, the keeper was banned from all physical contact with the bear. Within a year, Knut’s adoptive parent died of a heart attack at the age of only 44. Yet that was exactly what endeared him to millions of fans and made Christina Meier go back to the zoo day after day. A lion or a gorilla might occasionally throw the visitor a contemptuous glance, but otherwise the animals inhabited a mental space entirely separate to ours. Whether chasing each other round a climbing frame, like the little squirrel monkeys, or coiled as statuesque as a snake, they were indifferent to the bipedal primates peering at them through bars or plastic. But not Knut. He lived for human interaction. ‘I was often there early in the morning before anyone else,’ Meier told me, ‘and he would recognise me and swim over to the screen. He loved having visitors.’ The screen was about two metres high and next to Knut’s pool. ‘One of his favourite games was to surprise the little children by suddenly rearing up out of the water right in front of them, pressing himself against the Plexiglas.’ Another was playing catch: Knut would stand on the rocks next to his pool, pick up a ball in his jaws, and throw it with a swing of his head over the screen to the waiting crowd, causing giggles and squeals of delight. Willing visitors would throw the ball back, often prompting Knut to dive into the water with a great splash in his effort to catch it. These dog-like antics ensured that Knut remained popular, even when he grew out of being a teddy bear and into a large, yellowish beast. His first birthday party, on 5 December 2007, was attended by hundreds of children and broadcast live on television; the German national mint issued special commemorative silver coins. Knut represented nature and wildness, yet he wanted to reach out into the human world. He was a liminal figure, inviting us to share the fantasy of inter-species harmony that had been started by Dörflein; making each visitor feel like a Saint Francis of Assisi who could commune with the animals. But these kind of tricks appalled anti-captivity activists such as Frank Albrecht, who believed that they reduced a magnificent creature to a circus sideshow. I visited Albrecht at his home in Nürtingen near Stuttgart, a six-hour train ride southwest of Berlin. His flat, in a small block typical of those built after the war throughout West Germany, was filled not with images of real animals, but rather imaginary ones — dragons, orcs, and other figures from Tolkein. With coffee I was offered soya milk: his was a strictly vegan household. Short, mustachioed, and serious, Albrecht had made Knut a superstar — and himself notorious — by calling for the death of the delightful, defenceless little cub. Only he hadn’t. That is not what he had called for at all, but rather how the Bild newspaper had chosen to sensationalise his words. In fact, he had said almost the complete opposite. ‘I was drawing attention to a contradiction,’ he told me. In the same month that Knut was born, the zoo in Leipzig had killed a sloth bear cub that had also been rejected by its mother. They argued that raising a bear by hand would inevitably lead to it becoming disturbed and, therefore, to a life of suffering. ‘I believe all animals have a right to life,’ said Albrecht, ‘so I took the Leipzig zoo to court.’ Yes: he took them to court for not raising the bear themselves — for not doing what the Berlin zoo did with Knut. The court, however, ruled in the zoo’s favour. When talking to Bild about Knut, Albrecht had argued that if the Berlin zoo were to follow the precedent of the Leipzig zoo, then the little polar bear should be put down. The Bild somehow neglected to print the first part of the sentence. As a result, he found himself suddenly a celebrity — of sorts. He received death threats along the lines of ‘Why don’t you have yourself put down?’ and was harassed in the street. But a career in activism — in particular for the pugnacious group PETA — had made Albrecht resilient. Now he runs a campaigning group called EndZOO which is entirely dedicated to doing what its name suggests. Looking back, he welcomed the awareness-raising effect of Bild’s erroneous headline. Albrecht did not think that abandoned animals such as Knut should be killed. But the question of what should happen to zoo-born cubs that have been rejected by their mothers made him uncomfortable. ‘It is not a situation that should arise,’ he told me. Knut’s mother Tosca, Albrecht pointed out, was herself hand-raised having been plucked from the wild, and so had no role model for how to be a proper polar bear parent. Captivity itself was the cause of such unnatural behaviours. He accepted that bears in zoos can live longer than their wild cousins — up to 40 years old — but he argued that many more of the captive animals die in the first days or months due to dysfunctional parenting or other consequences of their unnatural existence. Throughout 2008, Knut continued to grow and to explore his enclosure, inventing new games with logs, balls and pillows to the entertainment of fans and the disquiet of activists such as Albrecht. In September 2009, when he was nearly three years old, a female polar bear called Giovanna moved into his enclosure while hers, in Munich’s Hellabrunn zoo, was being renovated. That both bears were not sexually mature did not stop many newspapers from speculating about romance. Albrecht, on the other hand, called for Knut’s castration. ‘Giovanna and Knut shared the same grandfather: if they mated, this would therefore be inbreeding,’ Albrecht said. Inbreeding within an ever-decreasing and degenerating gene pool is one of the great risks of captive-breeding programmes. Where they can, zoos nowadays avoid taking animals from the wild — it is bad publicity, runs counter to their claims to be supporting conservation, and is in some cases illegal. But this leaves them dependent upon a small population for their match-making. According to Albrecht, Knut’s father was himself a product of inbreeding. He speculated that this had already had negative effects on Knut’s own life chances. Permitting him to breed with his own cousin now would be a genetic catastrophe. When Giovanna moved back to Munich after nearly a year — not pregnant — many expected Knut to leave Berlin too. The zoo had enough polar bears already, and it was usual for males to be moved once they were large enough. But Berliners wouldn’t hear of it. 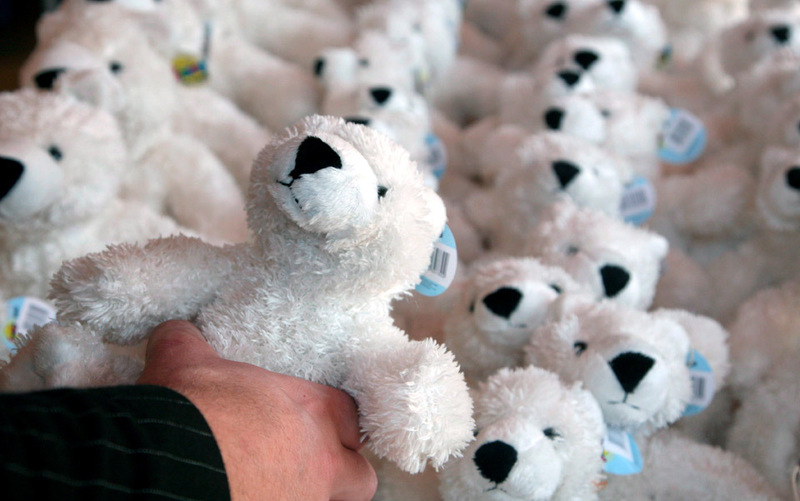 More than 26,000 of them signed a petition to keep Knut in Germany’s capital. Even the city’s influential mayor, Klaus Wowereit, called for the bear to stay. The zoo itself had little incentive to alienate its visitors by sending away their favourite attraction. In his first year alone, Knut was estimated to have brought an extra €5 million into their coffers, and attendance figures for 2007 were 30 per cent up on the previous year, making it the most successful in the zoo’s 168-year history. So Knut stayed and, after Giovanna left in September 2010, he moved into an enclosure with three female polar bears, one of whom was his mother Tosca. According to Albrecht, that is when the problems of Knut’s unnatural existence became extreme. Male polar bears are naturally solitary wanderers. Once they leave their mother’s side, they seek out other bears only to mate. Otherwise, they roam through the frozen wilds alone. ‘Knut was already suffering from the unnatural conditions of captivity. In the wild, a single bear can walk up to 100 km per day in search of food, covering many thousands of square kilometres. Their average territory is more than a million times bigger than the size of a zoo enclosure,’ he explained. As a consequence, Knut was already showing stereotypies — repetitive behaviour patterns that are typical of animals in captivity, especially large mammals. ‘He would just walk back and forth along a short path in his enclosure, over and over,’ Albrecht said. This is part of the paradox of zoos: that they exist to bring nature into the city, but the behaviour of zoo animals is anything but natural. Large carnivores suffer the most, as they are programmed to roam vast areas tracking their prey. And polar bears are the largest of them all. When the three females arrived, Knut tried to avoid them, often sitting alone on a rock by the water. ‘When polar bears are kept together, you can see how they try to steer clear of each other, to find distance,’ Albrecht told me. But of course, in an enclosure, this is limited to just a few metres. The second problem was, as Albrecht put it, that ‘Knut did not know how to get along with other polar bears.’ Having been raised by humans, he had become unable to deal with his own kind. The three females understood much better how to establish themselves in a bear hierarchy and joined forces to keep Knut down. In short, they bullied him. The German media showed pictures of Berlin’s darling being pushed around, bitten and scratched. When Knut died suddenly in March 2011, six months after moving in with the three female bears, many commentators were convinced that his end was not due to natural causes: PETA said it held Bernhard Blaszkiewitz, the director of Berlin zoo, personally responsible for the bear’s early death. Another anti-captivity organisation, Four Paws, blamed the history of inbreeding in Knut’s family combined with the impoverished conditions of his incarceration. Commentators argued that the separation from his human ‘parent’, and the company of the overbearing females had made him depressed and stressed, and therefore susceptible to illness. Many believed that captivity had killed him. For anti-captivity campaigners, Knut’s death demonstrated what they had said all along: that polar bears do not belong behind bars. Zoos, on the other hand, believe that their presence is essential to what the modern zoo is trying to do. Like a cross between a monster and an angel, with their fearsome size and cloud-white fur, polar bears have long been popular in captive collections. But since zoos changed their focus to conservation, demand for the snowy giants has risen, fallen, and risen again. When they were seen as endangered by hunting in the mid-20th century, many zoos opened polar bear exhibits; but when hunting was restricted and polar bear numbers began to recover, zoos lost interest. Then came global warming, with its threat to the polar ice caps. Polar bears were again perceived as threatened — this time from habitat loss — and their sheer impressiveness made them the perfect poster boys for the campaign against climate change. The idea that zoo animals are ambassadors for their species is oft-repeated in zoo circles. Critics such as Albrecht scoff. ‘What ambassadors are taken from their land by force and held in prison?’ he asked me. Some defenders of zoos take a subtler view: they accept that the life of their animals, particularly the large carnivores, is hollow and incomplete; yet they see this suffering as justified by the zoos’ mission to motivate people to care for the natural world. In this sense, Knut and fellow inmates are not ambassadors, but sacrificial victims, offered up in the hope that their wild cousins might be saved. A particular twist to the paradox of the zoo makes these sacrifices all the more poignant: on the one hand, the animals are supposed to stand for their species — to be, for example, a polar bear just like those in the wild. Yet zoos attract many more visitors and attention if they market their animals as unique individuals — Bobby the gorilla, Cute-Crazy-Knut. We might be interested in wild polar bears, but we can only identify with a particular polar bear, preferably one with a name and a widely promoted, human-like personality. And, unfortunately for zoos, once an animal is seen as unique, its plight becomes the object of much more intense scrutiny. Polar bears in general live and die without the world’s press showing much interest, whereas Knut’s passing was a tragedy, a mystery and an accusation. To millions of people, he was not just a bear, he was a person. This might have helped to fill the zoo’s coffers, but it also brought unsustainable attention to Knut’s every move. Once hauled from the water, Knut’s body was sent to be autopsied. If the distress of captivity had led to his death, then elevated levels of stress hormones would still be measurable in his adrenal glands. If, on the other hand, a history of inbreeding had led to some fatal weakness in his constitution, then this should be visible through genetic analysis. Either would be a debacle, not only for Berlin zoo, but for the principle of keeping wild animals in human hands. But even in death, people project on to the blank white space of the polar bear their ideas of the natural and the unnatural; of the wild and humanity’s place in it. Amid the shelves of stud books and registries in his little flat nestled in the hills of Nürtingen, Frank Albrecht believes he can prove that Knut was a victim of mankind’s meddling in nature. ‘I’ve examined the reports of the deaths of bears in zoos going back over 40 years,’ he told me, ‘and there are numerous cases like Knut’s, including in his family.’ He accepts that a virus brought on the fit, but not that this makes the zoo innocent. It is a very different polar bear that is memorialised in bronze in Berlin zoo. The freshly cast statue — ‘Knut the Dreamer’ — shows him as a cub, relaxed and content, his chin resting on one paw. At the official unveiling on 24 October 2012, I met up with Christina Meier, who is still blogging about her bear, although it is now 18 months since his death. Between taking photos to post online for the benefit of the loyal followers in faraway countries, she told me that the statue had captured Knut’s essence — playful, attentive, and self-assured. As I watch those fans who have turned out for the ceremony, mostly women, some carrying flowers— one or two bearing croissants, I wonder just how many Knuts there are. Meier’s bear, goofy star of the Cute-Crazy-Knut blog, is clearly a different animal from Albrecht’s pining wretch, inwardly wilting, and far from his natural home. It is not Knut the Dreamer, but Knut as we dream him who is realised in bronze for future generations to chirp and coo over. Zoos often present themselves as a kind of Noah’s Ark, saving the animals two-by-two from the danger of extinction. But critics see them as nothing more than salves for our conscience: the animals are chosen for charisma, not endangered status; their lives in captivity make them utterly unequipped to survive in the wild; and they are too few to make viable breeding groups. Rather than raising awareness, zoos might be hindering us from recognising the reality. We humans are not the Ark; we are the flood. We might search for nature in zoos, but what we find are our conflicting ideas of nature reflected back at us. Those who believe we can live in harmony with the beasts and so redeem ourselves will try to catch the eye of the next animal superstar. Those who believe that the natural world is wild, noble and better off without us, will continue to argue that captivity is not only wrong, but that it killed the world’s most famous polar bear. Meanwhile, Knut himself now resides, not in an ark, but in an archive: in the museum’s catalogue of what we’ve lost or stand to lose. Here he will take his place in the cabinets of the undead, half bone and fur, half sawdust and iron; poised in the shape of a taxidermist’s dream.